Byakhee JP & I had a game on Saturday – a nice break from campaigning. We used the scenario that the AVBCW community are using to form a national campaign: The Game In the east Red Force, in the West Blue Force. To control the Fosseway both side must hold the 3 farms on the Foss. In the north Bridge Farm, the centre, Grange Farm and Brookfield Farm is in the south. 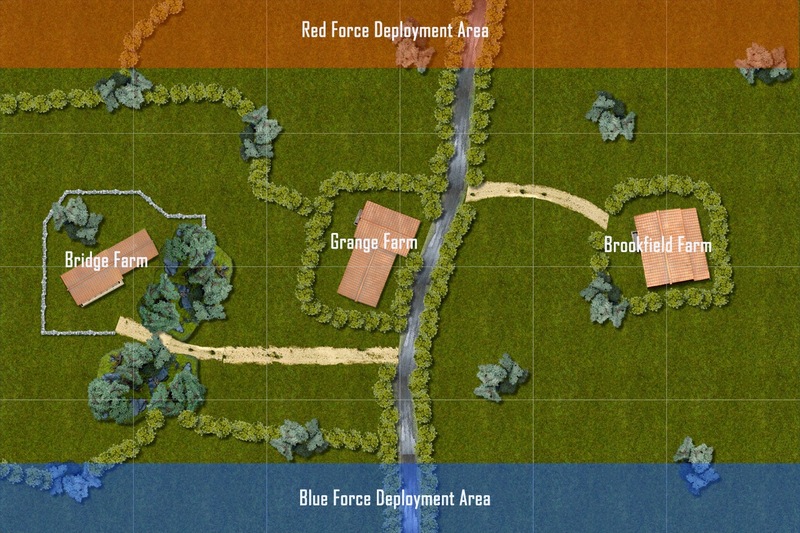 Both Red and Blue Forces plan to send small forces forward to take the farms before the big battle starts. Any player or group of players fights a battle for 1 or more of the farms and tells us who won, Red or Blue. They can fight it in any scale and with any size force, all we need to know is who won. We add up the results and the winners for each farm hold it when we do the big game at Partizan. In one of the farms there is a part of the Crown Jewels collection, laying hidden, so at the end of the game, the players can roll to see which farm it is in and whoever controls the farm also has procession of a part of the Crown Jewels. Obviously we amended the background so that is was a downed plane somewwhere near the Malverns. The story so far:- Communist agitators have raided the Tower of London. 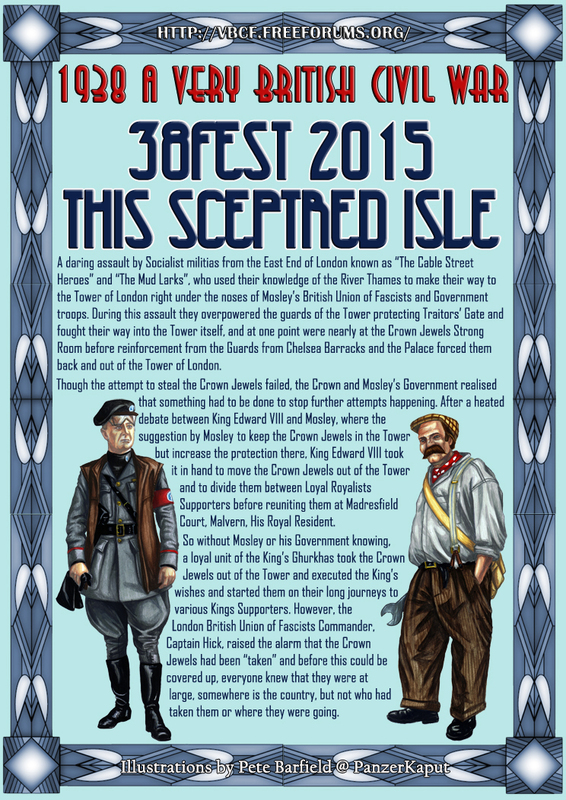 Whilst the attack was easily beaten off, it was enough to rattle the King, who, without consulting Prime Minister Mosley, has ordered that the Crown Jewels be split up and sent by diverse routes to his residence in Madresfield. Alas many of these packages have become lost on the way, causing factions throughout the country to seek, locate and squabble over the contents. Within spitting distance of Madresfield, a portion of the Crown Jewels has been discovered near the Malverns in Herefordshire. Their location has been narrowed down to three farms and the Malvern Hills Conservators, eager to show their loyalty to the King, have decided to retrieve them. However the local chapter of Blackshorts, keen to enhance their prestige, are also searching for the jewels. Thus these hypothetical allies renew their rivalry and clash once more.